An award winning spectacular, attractive & very modern one bedroom ground floor apartment / holiday home with satellite television and wireless internet included. 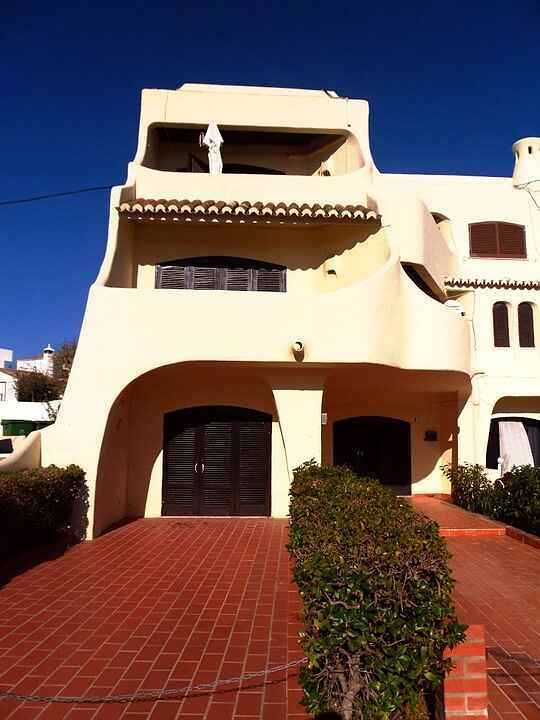 The property is located within a very popular holiday destination of the Algarve. With it's very own private driveway & patio area for plenty of sunbathing (2x sun loungers provided) & also a roof-top-terrace offering all day sun which provides panoramic views of the cliff tops, golden beaches & the deep blue sea. Fully furnished to a very high standard with all new furnishings & equipment which provides comfortable accommodation for up to four people. Car hire is not essential as everything can be found within the town of Carvoeiro offering plenty of bars, restaurants, chemists, car hire, souvenir shops, food shops & also off-licences. Carvoeiro is located west of Faro international airport which is only a 40 minute drive & 15 minute drive from the Algarve shopping centre. Contact the owner for airport transfers & cheap car. An Award Winning Holiday Apartment as voted by past holiday makers on Holiday Lettings. Algarve Vacations ranked as an overall winner in the hall of fame 2011, followed by the top 10 in the best apartments category & top 10 places to stay for winter sun. More information can be found in our main website. A heater and cooling fans are available in this property if needed. The property and location is perfectly suitable for couples and small families, young and old! Car hire is not essential, as there are plenty of airport transfers from the airport, including taxis, buses and also a very cheap airport transfer shuttle bus (if the airport transfer is required please contact the owner for additional information and rates). Carvoeiro offers a taste for all ages. Whether it be a place for a couples holiday; a family get together or also for those younger generations. Carvoeiro offers a fantastic selection of restaurants, cafe's, bars, bistro's, fish and chip shops, off licensing, souvenir shops, jewellers, car rentals, banks, foreign currency exchange bureau and much more! There are many tourist attractions and also a wide variety of activities including aqua water slide parks, zoo marine, jeep safari's, horseback riding, tennis and badminton clubs plus much more! 3 very popular golf courses are also within convenient distance from this property. All of the above information along with a updated welcome pack is provided in the property, so your never stuck for ideas! Fly to Faro international airport - the apartment is just a 40 minute drive (50km) from the airport. Cheap flights are available from Easyjet, Ryanair, Monarch, British Airways, Jet2, Bmi, Flybe & many more depending on your departure location! Car hire is available at great discounted rates all year round - please 'contact me' for further information. There are regular transfer shuttle buses available all year round from the airport straight to the apartment, (usually around 15 Euro per person return! ) - please enquire. Guests are advised to take adequate insurance cover for their holiday. A £150 deposit will be required immediately after requesting your holiday dates for any damage or breakages which may occur. The deposit will be refunded within a week after full inspection of any breakages and/or any minor/major damages to any furniture, equipment or to the actual property itself. Full booking payment must be paid promptly within 8 weeks prior to arrival. If booking after the 8 week period then full amount will be required. ''Thank you for letting us rent your property for our April spring break. The property was lovely and had great facilities within. The area surrounding the property was great and we had a great holiday and nice weather. My wife and i would recommend your property to future customers and we will certainly be telling our friends and plan to return in the future. Thanks again ! '' - Grant. ''The house is fantastic and cavoeiro is wonderful. We sure want to get back to carvoeiro next summer and we hope you will be our host once again. The house was everything we expected, cleaned very & well decorated'' - Joel. To continue providing an excellent holiday experience for others please may I ask that you fill in the short survey located in the Welcome Pack of the Apartment. It will be most helpful as confirmation of those things we have done well and will also let us know if there are improvements we can make. Thank-you in advance for taking the time to do this.